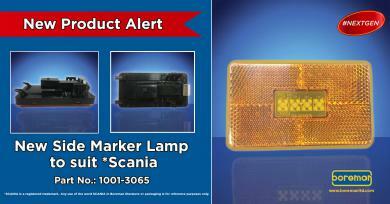 Boreman are delighted to introduce the New Side Marker Lamp to suit *Scania (NextGen) - Part No. : 1001-3065. A direct replacement, this lamp can also be retro-fit to older *Scania models, allowing them to be modernised with the latest lighting options. Every driver wants their truck to look as fresh as possible - We now give you this option!!! For further details about the New Side Marker Lamp to suit *Scania - Visit "Truck Specific Lighting" in Our Products Menu or contact your local supplier. *SCANIA is a registered trademark. Any use of the word SCANIA in Boreman literature or packaging is for reference purposes only. Our Full LED Driving Lamp with Light Bar on Manners Transport's Scania V8. This beauty features on the front cover of this month's Truck and Driver magazine. 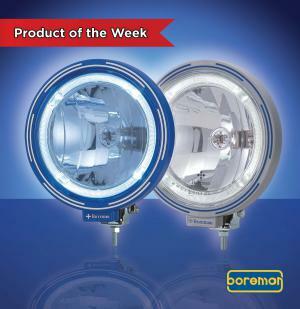 Click here for further details about the Full LED Driving Lamp with Light Bar. This classic design 9" round spot lamp complete with Osram LED ring is now back in stock! One of our biggest selling products! Click here to visit Spot Lamps on Our Products for further information. Keep up to date on all our products by following us on Facebook, Instagram and Twitter. The Ultra Slim Smoked Chrome Light Bar has 5,400 Lumens (1 LUX @ m 394). This will add vibrance to your truck and help you stand out from the rest. 100% Waterproof, Rust, Corrosion and Freeezing Resistance with a Mounting option of a Side or Bottom Bracket for easy installment. With a Life Span of 50,000 hours and a 1 Year Warranty, the Ultra Slim Smoke Chrome Light Bar has a lot to offer. For further information about the Ultra Slim Smoked Chrome Light Bar check out "Our Products" on the website. 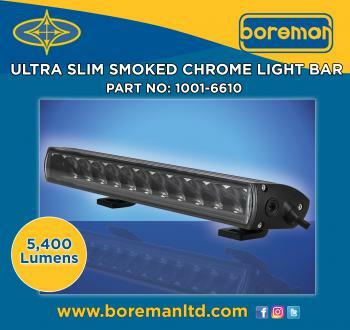 Socialise with us on Facebook, Instagram and Twitter for further info about the Ultra Slim Smoked Chrome Light Bar and all that Boreman has to offer. Why not send us your photos of your beautiful Trucks, and we will put them up on our Gallery page for everyone to see. Boreman Ltd - T: +353 49 4367049 // F: +353 49 4367095 © Boreman Ltd.